The Kauai Cigar Company was born on our Blair Estate Coffee farm, which has been growing fine rich-flavored organic coffee for well over a decade. Like the passion we have for great coffee, our love for premium hand made cigars led us to investigate the art of tobacco growing. Amazingly though, these roadblocks opened up a new road to success. While looking for a solution to the problem, we were introduced to a valuable contact based in Nicaragua that would be able to manufacture our premium tobacco into cigars. Once our aromatic Kauai tobacco reaches Nicaragua, it is fermented in bulks, transforming starches into sugars, and allows the tobacco to become sweeter and finer in flavor. With the careful regulation of humidity and temperature, fermentation “sweats out” impurities that can cause harshness in flavor and scent. After fermentation, the leaves are secretly aged to perfection allowing the tobacco to take on character, a smoother scent, and richer flavor. We are receiving high praise for the deep, complex taste, and fragrance resulting from our exclusive aging process. When asked how we are able to produce such smooth and rich tasting cigars, our response is the same as we give for our coffee. It is a labor of true love, and because we personally oversee every step of the process it becomes possible to create an exceptional cigar. And, as with all of our products, we personally guarantee the quality of our cigars or your money back. For more information and a complete list of licensed retailers, please visit our web site at kauaicigar.com. 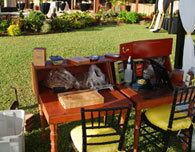 The Kauai Cigar Company also offers you the chance to purchase Island Prince cigars online at coffeetimes.com. We do not retail cigars from our working farm. Please enjoy the fruits of our labor. We promise that you will not be disappointed.